Rider Horse amounted to no more than a ranch in the backwater of Inner Mongolia when SMC Capital China first invested in 2012. Five years on, the company is China’s biggest equestrian trader with internationally connected operations in animal transportation, quarantining and inoculation. This evolution – estimated to have contributed to a 10x valuation increase – was guided by an SMC analyst who had no previous connection or experience with the horse industry per se. After Siyao Zhao developed a passion for the business during the due diligenceprocess, SMC backed her engagement as assistant to the Rider Horse’s chairman. The move precipitated a concerted cross-border expansion program that included establishment of a joint venture with a New Zealand feed production partner,ties to the Hong Kong Jockey Club and an introduction to one of Australia’s leading racing breeders. As SMC gears up to make Rider the first horse sports play to list on a Chinese exchange, a number of lessons about establishing an effective in-house value-add machine come into focus. The firm’s approach of combining patient talent cultivation with thoughtful procedural implementation is beginning to be seen as indispensable, especially as private equity investors face more intense competition in Asia’s emerging markets. Whatever opportunity set an investor pursues, an operationally minded internal policy structure and culture is required to realize a plan of attack. 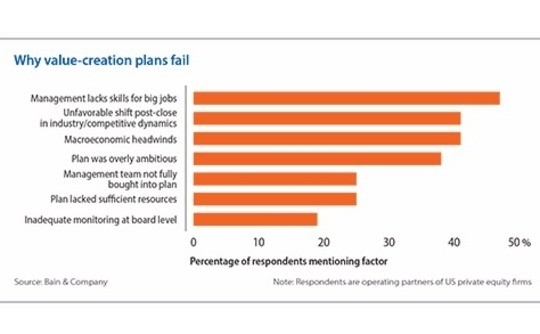 Although PE firms often blame portfolio company management for failed value-add plans, most growth inhibitors trace back to poor execution of traditional GP inputs such asstrategic command, resource provision and macro vision. The most rudimentary playbooks take the shape of a 100-day plan, which now represents a de facto industry standard for initial monitoring of theoperational, financial and competitive risks identified during due diligence.These programs are flexible and therefore more attractive to GPs with atendency to eschew rigid workflow frameworks. As markets become less conducive to proprietary transactions, they are also being seen as an increasingly essential way of showcasing a competitive value-add edge. More ambitious efforts along these lines have applied “blueprinting” or value creation plans that are customized according to various deal theses andcase-specific factors such as ownership structure. Initiatives range frommeetings between portfolio CFOs to share best practice knowhow to prioritizing situation-specific metrics in monthly flash reports. Although a vast majorityof Asian GPs now include some kind of post-deal value creation targeting intheir financial models, relatively few investors are disciplined at applying best-practice process exercises consistently across portfolio businesses. Early involvement of partners with an operational background is often seen as the key to setting up more actionable post-deal plans. During the deal assessment stages, help identifying and quantifying value-add opportunities can diffuse pushback from a wary portfolio company management team and allow for a more seamless approach. While value-add thinking has not yet been widely integrated into the due diligence work of Asian GPs, steps are being taken in the right general direction. For example, in an increasing number of deals the operations team is deployed as soon as the investment committee greenlights initial post-diligence acquisition negotiations. Even legal agreements, however, can be difficult torely on when working with a proud founder-owner with strong cultural control of a company and set ideas of how to proceed. In minority investment situations,early value-add talks are therefore perhaps most important in that they pave the way for a less defensive reception in future discussions about changing operational tact. Ascendent’s approach typically includes years of consultation as a third-party technical advisor to a company before an equity investment, usually a large minority stake, is even considered. As a result, the firm is able to erase the common PE stumbling block of transitioning from deal mode to value-add mode with an awkward handover of responsibility from the financial team to the operations team. Post-deal, a small in-house task force is built around the portfolio company based on long standing relationships. In this way, clout, good will and dependence are the foundation stones for value-add efforts launched by minority investors – with the possibility of assuming full ownership later on if a portfolio companyproves inclined to exercise weak judgment in the face of business headwinds. Indeed, control is increasingly a priorityfor GPs looking for returns in markets in which the focus is shifting frommacro-driven top-line growth to bottom-line gains rooted in greater efficiency.LPs are conscious of this development too, resulting in greater scrutiny of howwell-equipped private equity firms are to create stronger companies. At the same time, the maturing of these economies means more founder-owners arewilling to consider full sales. According to AVCJ Research, the number of private equity transactions realized in mainland China between 2011 and 2016 was 28%higher than in the prior five-year period, but buyout activity rose 80%.Likewise, the total number of Indian deals for the five years to 2016 was 45% higher than the prior corresponding period, but the volume of control transactions climbed 69%. Whether participating in a minority ofmajority context, establishing a differentiated view of a company’s business drivers is at the core of any private equity value-add agenda. And given atypical diligence period may last no longer than 3-4 weeks, there is animperative to quickly pressure test strategic angles based on information outside of the founding management’s scope. A few proprietary levers of this kind will be neededon both ends of cash flow equation. For example, if customer loyalty has not yet been nominalized in company metrics, go-forward plans might consider cross-selling or upselling products instead of seeking additional customers.Where cost control rather than top-line growth is the priority, care will beneeded itemizing which specific expenses have to be addressed and how this canbe done without under mining the rest of the organization. Data collection is at the heart of this effort. The best analysis will transcend financial intelligence to encompass abroad set of forward-looking indicators and operational metrics around difficult-to-quantify areas such as customer satisfaction. Points of study mayinclude information not usually associated with the target industry, be it distantly related commodity price trends or projections on the business pressures that could impact the reliability of critical corporate clients inother sectors. Differentiated viewpoints will also be grounded in team profile, especially as investment and operational partners collaborate more closely on due diligence. As a result,private equity firms are increasingly obliged to follow the cues of the consulting services sector by putting more emphasis on so-called EQ, oremotional intelligence, social skills. This dilemma is particularly prominent in Asia,where many elder professionals have little patience for the minutia of operational clean-up, but cultural issues make it harder for younger, more engaged partners to exert sufficient influence. Further, the region’s relatively short history with PE and its broad diversity of languages, culturalnorms and geographical factors have cramped relevant talent pools, forcing most GPs to make staffing compromises. The limitations and demands in Asian talentoften play into the “all-in-one” model of GP team building, whereby a senior partner is expected to know strategy and operations as well as how to lead the deal team. The all-in-one boss is often a good fit for the value creation needs that are most common in Asia such as tighter financial reporting and growth planning. However, the former CEOs of conglomerates who are often poached for this position are typically characterized by the industry as brand ambassadors rather than practical, hands-on operators. The all-in-one model therefore tends to make considerable use of outsourced advisors, including boutique specialists that focus on PE portfolio work. The approach can be further supported by adding value-add experience to the deal team without establishing a formal operations unit. Variations on these theme scan be seen in The Carlyle Group, which brought in former Coca-Cola Asia President Patrick Siewert as its consumer retail guru, and Bain Capital, which puts a strong emphasis on hiring internal leadership with a consulting background. Other large firms including TPG Capital build almost entirely in-house teams, with all functional expertise ready fordeployment on a deal-by-deal basis. KKR combines elements of both boutique outsourcing and in-house reliance with KKR Capstone, a separately managedoperations firm which uses the KKR name under license but benefits from accessto synergistic value-add opportunities in the PE giant’s extensive portfolio. Smaller GPs, meanwhile, need to selectively place their bets on generalist knowhow and where to go deeper with sectional or functional expertise. Having someone on deck who can step in to run a businessif needed is a typically sought-after downside risk protection mechanism,although pre-hiring portfolio CEOs is not advised. SMC takes a hybrid staffing approach that includes a group of operations-focused venture partners who periodically complement a number of specialized full-timers who are able to work across the portfolio. For example, the firm leansheavily on specially contracted value-add advisory from beverages industryentrepreneur George Chen while Zoe Zhu, the in-house human resources director,focuses almost entirely on the recruitment needs of investee companies. SMC augments its approach of being relatively lighton dedicated in-house operational staff by producing Chinese-language manualson best-practice governance for portfolio companies. The material covers topicsas basic as why board meetings should be held and the meaning of a quorum. Butit also offers guidance on more nuanced business development challenges,including how to set up attractive compensation packages in China’s unwieldyregulatory environment around pensions and benefits. Compensation represents an important issuein setting up value-add infrastructure within a GP. Indeed, a commonlycirculated maxim states that one can judge how much a PE firm values itsprofessionals by how much carried interest it shares among them. Nevertheless,many firms do not allocate a significant portion of the economics to operatingpartners, resulting in a division of interests, internal tensions anddifficulty attracting top talent to the ops team. “Theimportance of operational value-add to a firm's performance can be assessed bylooking at the firm's DNA, the ‘technology’ of how operating partners andfinancial partners work together, how many senior operational staff the firmhas, how the economic pie is split among the operating partners and financial partners, and the engagement model of the firm with its portfolio companies,”says James Ahn, managing director at CD&R. CD&R is regarded as a pioneer in value-add,with an operational model has been in place for 40 years. It focuses onalignment by formally partnering a financial partner with an operating partnerat every step of an investment from transaction sourcing to exit. The growing demand to institutionalize similarly oriented value-add protocols, however, goes beyond internal teamunity or even realizing consistency in company-building performance. This isbecause the strategy is ultimately a reflection of the underlying culture of afirm and, as such, is set to be a chief concern among LPs during fundraisingrounds to come.